Bringing ET-134 to Kennedy Space Center has one purpose; launch STS-130 to the International Space Station. NASA’s top priority today is to fly the space shuttle safely and complete construction of the space station. It’s been a long road getting from there to here! Scroll over to your right, then down to space station over flights of your town. Click and you’ll find yourself on a NASA Johnson Space Center Website. In the left column you’ll find a place to enter your country and find your home town and that’ll show you when the space station will overfly your town. The over flight will be fast; and the time of day is important because space station is best viewed just before dawn or the beginning of morning nautical twilight and just after fading evening light or the ending of evening nautical twilight; perhaps the station will approach from the southwest, sail over your town in 2-5 minutes at 220 miles above you and depart to the Northeast. I hadn’t made an effort to see the station over fly Huntsville, Ala., for quite some time, until one day last year I studied the tracking charts, found that it would make a spectacular flight over Huntsville in a few days. That evening I hooked up my two bichons and went out to see the station. It was an amazing over flight. With ten-power binoculars I could detect a great deal of detail including that the space shuttle was docked, a gigantic spread of sail, or rather, solar arrays, and the space station had grown — big time — to the size of a football field. When I joined NASA in 1991, I was immediately joined at the hip with space station. It has been part of my daily duties ever since in one public affairs capacity or another. The space station has evolved from development models and design charts to real hardware during the intervening years. It is simply a marvel, flying through space at 17,000 miles per hour, brighter than the stars; so much so you might say it is a star…well, it is a Star! The space station is why we’re on this journey. We are bringing the gas tank, ET-134, for space shuttle mission STS-130, during which space shuttle Endeavour will deliver to space station Node 3, named Tranquility, the last of the three nodes built by our Italian and European space partners. The space station has been a dynamic and fruitful partnership for its members; including the United States represented by NASA, the Russian Federal Space Agency, the European Space Agency, the Canadian Space Agency and the Japan Aerospace Exploration Agency — I particularly like the title of the Japanese space agency because they have included the word “exploration.” The specific nations in the partnership have included Canada, Denmark, Belgium, France, Germany, Italy, Holland, Luxembourg, Norway, Spain, Sweden, Switzerland, Great Britain, Japan, Russia, and our very own United States. Space station flight operations are controlled from the Johnson Space Center in Houston, Texas, and the station science command post is located at Marshall Space Flight Center in Huntsville, Ala. European Headquarters is in Paris; the Canadian Headquarters is in Saint-Hubert, Quebec; the Russian Station Mission Control is in Korolev, Russia; and Japan Aerospace Exploration Agency headquarters is in Tokyo, Japan. By any stretch of the imagination space station has been an unqualified success in political, technological, engineering and scientific partnerships and is perhaps the greatest demonstration of peaceful human cooperation and achievement in history. It is a testimony to what humanity can achieve in unity of purpose and peace; and a testimony to the role of space travel to bring together diverse peoples for common good. This year the spacefarers expanded the crew on space station from three to six and expanded the available working and living space. Three space shuttle flights delivered Japan’s Kibo scientific research laboratory module, a supporting logistics module and a unique facility for mounting science experiments outside the Station. Also, in the past year a space shuttle delivered the Columbus science experiment module built by the European Space Agency. The Russian Space Agency continues space station support by launching frequent logistics flights using their Progress automated rendezvous and docking vehicles. Russia also launches astronauts, cosmonauts and other visitors via their Soyuz launch vehicles. Russia also maintains Soyuz vehicles on station for potential emergency evacuation. There were two recent additions to the family of spacecraft arriving at the station this year as well. 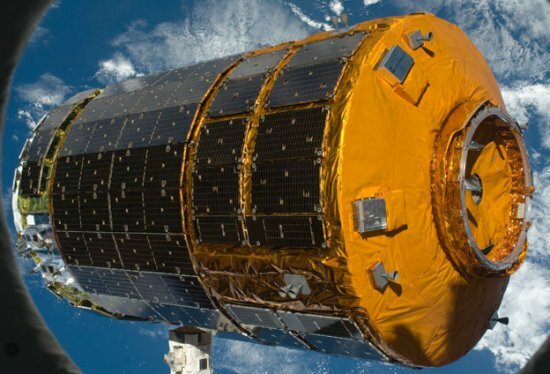 The European Automated Transfer Vehicle (ATV) docked at station in March 2008 and just last month, in mid-September 2009, the H-II Transfer Vehicle of Japan successfully launched and arrived at the station. Both transfer vehicle arrivals mark a substantial increase in operational capability at a time when the shuttle program is due to be completed. Up until now the emphasis of work on station has been directed at the assembly of arriving components such as nodes, solar arrays, and life support systems; and mastering the operational and engineering tasks necessary to keep the station properly functioning and maintained. 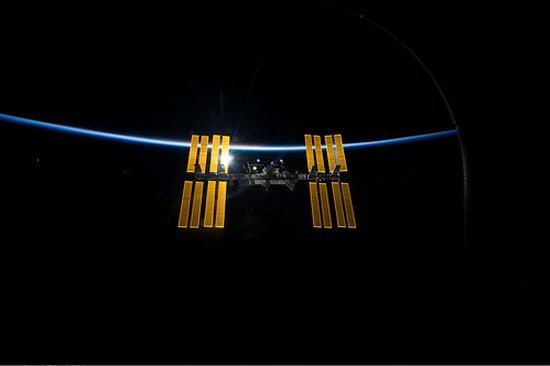 On this site you will find a mountain of information about the station, including great image galleries, how to view the station as it passes over your town, many interactive features, tons of statistical information and my own favorite aspect of space station, science experiments on station. The transition that will gradually occur on station over the next few years will involve the transition from assembly activities to science. Today there are some 96 science experiments on station encompassing almost every science discipline found on a university campus or at a national research laboratory. Indeed, NASA has officially designated the space station a national research laboratory open for business. Much of the science on station up to now has focused on study and analysis of how humans adjust to low levels of gravity and human physiology. Just a few months ago, in August 2009, space shuttle Discovery delivered the new Materials Science Research Rack (MSRR) and the Fluids Integration Rack (FIR). The MSRR will permit study of materials such as alloys, ceramics, crystals, polymers and glasses for new materials applications and ways to improve existing materials. The FIR will help add to our storehouse of knowledge about fluids under microgravity conditions and aid in development of better fuel tanks and water systems for spacecraft. Science in space began gradually. The Gemini program astronauts and even the Apollo astronauts had precious little space in their spacecraft for experiments dedicated to science although they performed an impressive amount of science, regardless. The first American spacecraft dedicated to science in a substantial way was Skylab and later Russia added the Mir Space Station. Skylab was America’s first space station, it was fairly roomy compared to cramped Gemini and Apollo and Skylab hosted a vast array of science work. Spacelab came after Skylab. Spacelab, planted in the cargo bay of the space shuttle, flew some 25 missions dedicated to science investigations. Twenty-one of these science missions were controlled from Marshall’s Payload Operations and Integration Center, while Johnson Space Center controlled the flight operations. It may not be generally known but the European Space Agency designed the science facilities of Spacelab, the inner functioning and layout of the working module, while NASA provided the spacecraft, the shuttle, and many science experiments sponsored by universities, NASA centers and other government agencies. The partners of Spacelab learned a great deal from space-based science and how to control and operate experiments autonomously from ground stations located at universities or NASA centers. Unfortunately, the Spacelab missions had short durations, only 7-16 days. The promise of space station was to deliver a state-of-the-art orbiting laboratory and one that could function 24/7. And deliver it did. Today, scientists see their experiments launched into space and once the experiments are activated, scientists can control and collect data from those experiments from ground stations. 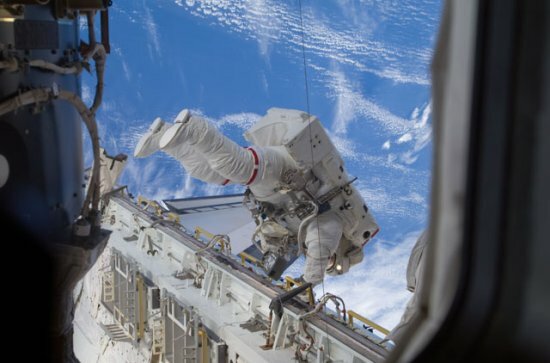 Many experiments require direct astronaut involvement, but many do not, freeing the astronauts to perform their own science investigations and operate the station. The increase in the number of astronauts and experiment facilities on station will triple the number of hours dedicated to science in the next few years. And it’s not in 7-16 day increments — the duration of a space shuttle mission!! — it’s 24/7. So there you have it. Long term it’s about utilization of space station for a growing array of science investigations that will enhance our knowledge of living and working in space while enhancing our knowledge of science for all of us on Earth. What’s ahead? The International Space Station will play a major role in getting us ready for the next big step, human exploration of the Solar System. It has been a long road getting us from there to here! Now we’re here!